Big face watches for children, easy to read both time and calendar with LED backlight. Original Japanese digital movement, provide precise and accurate digital time keeping for kids, working with more stable and less noise .As a gift to your children's best choice. High hardness resin glass protect you from daily light scratch . 5 ATM water resistant suitable for daily use and different kinds of outdoor and indoor sports and activities, like swimming, washing, shower. Please DO NOT press any buttons under water. Please DO NOT use it in extreme hot or cold temperature. 【Multi Functional Kids Digital Watch】: Led Back Light, Chronograph, Stop Watch Timer, Alarm, These Functions Make This Boys Digital Watch Suitable For All Kinds Of Indoor And Outdoor Sports Use. 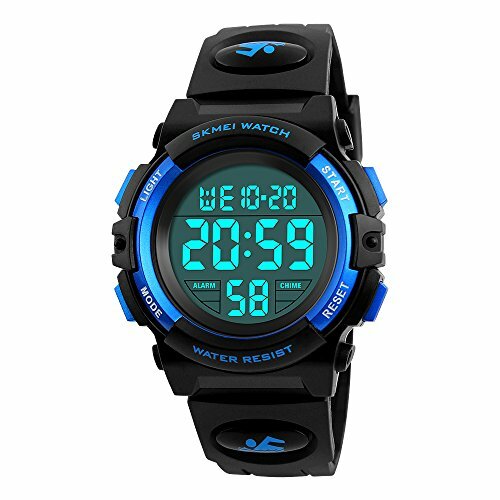 【Water Resistant Digital Watch For Boys】: 5 ATM ( 164 Ft / 50m Waterproof ), Swimming, Surfing, Shower, Hands Washing, Raining All No Problem! NOTE: Please DO NOT press any buttons in the water or wear this watch for longtime underwater activities - such as diving, ect. Too much water contact or usage in extreme Hot or Cold temperature will shorter watch life. 【High Quality Material Boys Watch】: Original Japanese Digital Movement, Provide Precise And Accurate Time Keeping. Bright Backlight Help You To Check The Time Anytime. Hardness Resin Glass Protect You From Daily Light Scratch. 【Comfortable Sports Watch For Kids】: Germany Imported PU Resin Strap, made of resin material imported from Germany,the strap is soft and comfortable and environmental friendly for kids. Soft Black Silicone Rubber Strap And Durable Rubber Case, Stainless Steel Case Back Bring Comfortable Wearing Experience. 【Easy To Set Up】: It Is Able To Operate The Digital Watch By Children Own. Nice Watch For Elementary Age Kids. Kids Watch Designed For Boys And Girls 5-12 Years Old, Fashion Gifts For The Kids You Love.As a gift to your children's best choice. If you have any questions about this product by Farsler, contact us by completing and submitting the form below. If you are looking for a specif part number, please include it with your message.